tallgrass prairie studio: Oops, I Did It Again! 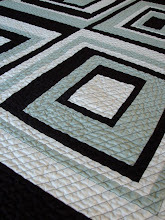 For those of you who have been reading my blog for a while, you may remember when I sewed 32 half square triangles incorrectly for my Zig Zag quilt. I really didn’t think I could mess up that much again. Stay tuned….I did a doozy this time! I brought a couple of charm packs with me to the country. I’ve had them for a long time. I never know what to do with charm packs once I get them. 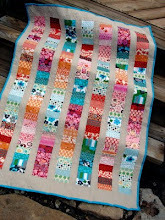 During Sew Mama Sew’s quilting month I saw this Whirlygiggles quilt. It’s a cute, quirky variation of a pinwheel. It is very much my style, and there was a tutorial by GreetingArts. I thought it might be a way to use up these charm squares. I read the tutorial, made the template and set to work. She did a good job in the tutorial…I just didn’t follow directions very well. The template was easy to make. I even marked the top so I wouldn’t inadvertently flip it over. (She warned about this in the tutorial.) I traced and traced and traced and cut and cut and cut and pretty soon I had 160 pieces. I looked at my neat stacks and smiled, pretty darn pleased with myself. I laid out the pieces and made little stacks to sew and started merrily chain piecing. I ran out of bobbin thread and decided to stop and press and complete a few blocks. I wanted to see those whirlygiggles. I started by putting sets together and something definitely wasn’t right. These were not fitting together. I went back and read the tutorial again. It didn’t take me long to figure it out. I had forgotten to add the ¼ inch seam allowance to my template. What to do? I had already cut about 200 pieces incorrectly. I’m not sure I had many options, so I pressed on. I sewed the first set together and then matched up the centers (even though the ends were way off) and made the block anyway. Then I trimmed off all the uneven ends so that I had an 8 inch block. And that is how the STUMPY Whirlygiggle block was born. I don’t think you can even tell that they weren’t meant to be this way. Sorry, no picture of the completed blocks. The internet is soooo slow out here, it takes forever to load pictures. Remember how I was so proud that I had marked the template so as to not flip it over. Well, I made three blocks that are the result of a flipped template. They are my “humility blocks.” Though I really didn’t need to make ANOTHER mistake to keep me humble. I truly can’t remember flipping over that template. I find it so weird that I flipped it exactly enough times to make 3 complete blocks incorrectly. I think they will go on the orphan block pile, maybe someday they will be pillows. After all that, I think this will make a cute donation quilt for the KU Med Center Pediatric Unit. I’m going to see if I can find some flannel for the back to make it cuddly. I have 24 blocks completed. I think I'll take them home to see what fabric I have in the stash for some borders. I want to do a peeper too! 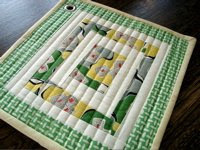 Peg, at Happy in Quilting has a great tutorial for how to add a peeper. I think it's such a great idea! 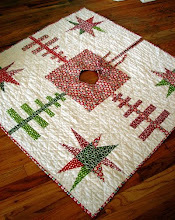 On the successful side, I finished the machine quilting on the Disappearing Nine Patch. The binding fabric is at home, so I can’t totally finish it until this weekend. I’ll wait to share a picture after it is bound and washed. I love the block and the whimsical weels! That could have been me... cutting all fabrics and discovering a mistake while making the first block... oeps... I’m sure your quilt will look great anyway. Curious to see some pics! Too funny, Jacquie! I think it all just fits though: Jazzy fabric; quirky shapes. It's all good! Thanks for restoring the faith.... It's nice to know I'm not the only one who merrily plunders along. I'm sure it will still be a great quilt. I downloaded that tutorial too! I love the color of that whirlygig fabric!!!! I love your block regardless. It's going to be a fun quilt. thanks for the link to the whirlygiggles tutorial. 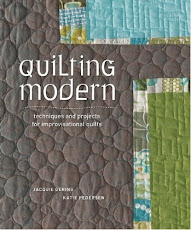 I love that quilt, and some day, when I am feeling brave, I think I'll have to give it a shot. and never knew about the peepers, either, but what a cute idea! 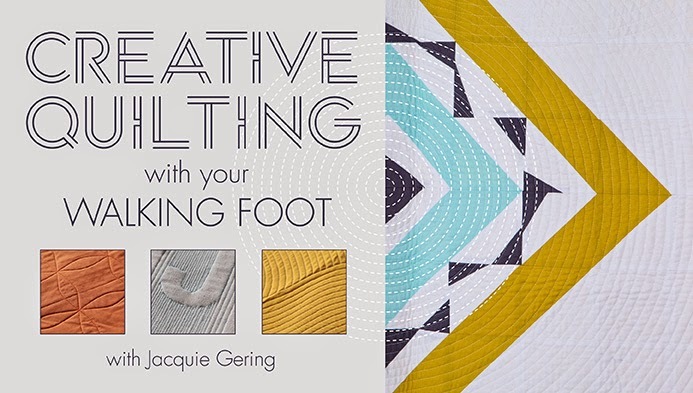 I won't even attempt that kind of triangle Jacquie so you are far braver than I. 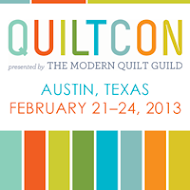 What size will this quilt be and do you think you have enough flannel fabric for the backing in your stash? Such a pity postage is so hefty or I would send you backings for these kind of things. Oh well, have to find some kids charities here to help with. Enjoy the rest of your stay with your folks. 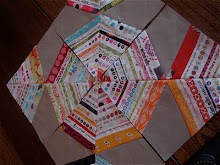 I love the blocks - you'll never know they are wonky when put together. Great job!! Nice to know I'm not the only one who goofs. Those stars I did? I tried freezer paper applique by hand, and all the stars were skewed, which would be okay for a folksy quilt but not for blue star moms. BTW, what's a peeper? Couldn't figure out from the tutorial. Your mistakes always work out perfectly! I love these whirligigs too ... I need to make a couple of baby quilts and what thinking about this as a design. They'd be great in batiks! I'm right with you on the constant mistakes...pretty much everything I make is slightly altered in some way! 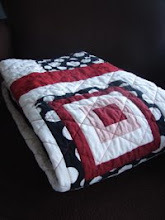 I really want to make one of these quilts now! I know that you posted this back in April of this year, but I just came across it and I too am making the whirligig pattern. I saw the pillow and had to look the quilt up. It seems you are not the only one to forget the seam allowance. I was doing a moke up with some scraps to see if it would work. Long story short. I had to make three blocks before I got it right. I am thinking maybe it is a Kansas thing?